The t-shirt you stole from your big brother. The shoes you saved up for months to buy. Everything we wear has its own story to tell. But how often do we stop and reflect on what our textiles say about us? With its “Unraveling Identity” exhibit, The Textile Museum brought to light how textiles have been used throughout history to express identity in its many forms, from personal to cultural to professional. But artifact-based exhibitions can sometimes feel distant and unrelatable rather than immersive. The museum wanted a way for visitors to engage with textiles directly in order to highlight their everyday relevance. We came up with a solution that put people right in the center of the story, allowing them to become a part of the exhibition. We took a familiar concept—the ubiquitous photo booth—and transformed it into a space for playful reflection and discovery. Visitors use a touchscreen to select the words that best describe them, choosing from a variety of categories and character traits. They pose for a series of photographs, select their favorite, and then find a detail in what they’re wearing and describe how it conveys their identity. When they submit their photo, it becomes part of a browsable digital gallery. 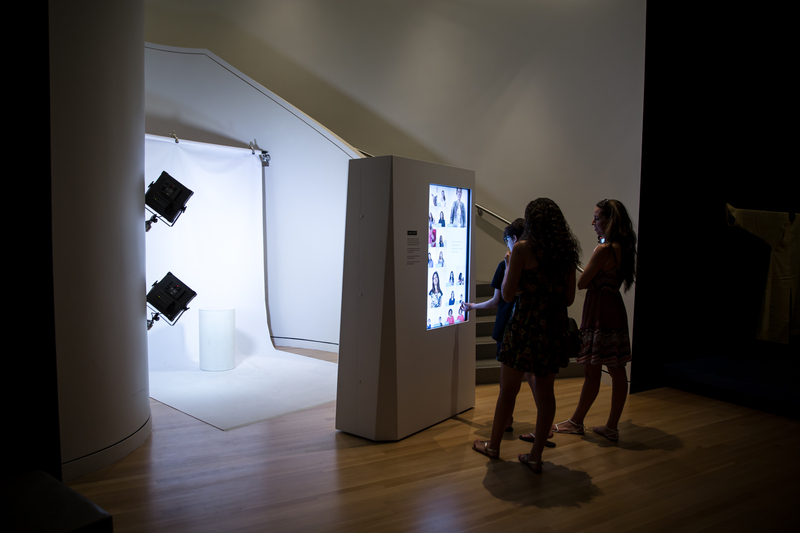 Visitors get to see the photos taken by those who share their identifiers, encouraging them to discover for themselves the common threads that connect us to our textiles—and to each other. Our clients were thrilled with the interactive’s instant popularity. They saw visitors of all ages and demographics enjoying the experience and even noticed people changing their clothing and coming back for another shot. Initially intended to be temporary, the installation is now a permanent fixture at the museum, and the “Common Threads” gallery continues to grow.